Post Oak Traffic Systems products allow customers to acquire a traffic data collection infrastructure at a very low cost--unprecedented in the traffic data collection industry. The standard process for device inquiry with Bluetooth scans all 79 channels of the 2.4 GHz band allocated for Bluetooth devices. By default, this inquiry process takes approximately 10 seconds to return the list of “found” devices. This poses some limitations as the inquiry does not return any MAC addresses and cannot initiate any other requests until the entire inquiry is complete. There are several issues with this process as it relates to producing quality traffic data. 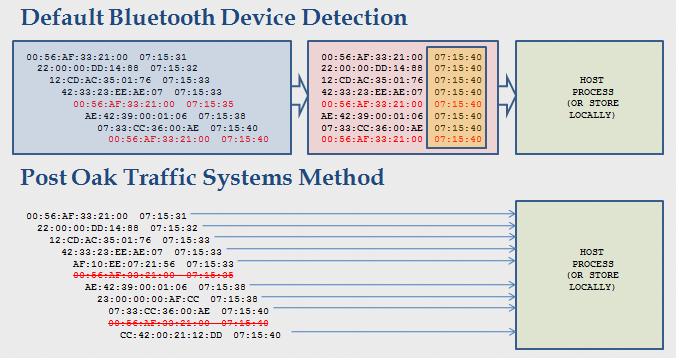 The actual detection time of the Bluetooth devices is unknown because of the 10 second inquiry time. For instance, a device could be detected within any point of the 10 second window, leaving a 10 second margin of error that could greatly influence the travel time estimation of a vehicle. All devices reported to be read in this 10 second interval are all time stamped with the same identical time stamp. The margin of error in the resulting travel time calculations increases as the spacing of the field detector stations decreases. The default inquiry process will only ‘find’ and return a device record for a maximum of eight devices per scan. With this limitation, it is possible that many of the Bluetooth devices in range of a detection station will not be recognized by the default software process. Potentially missing devices due to this limitation decreases the probability that a travel time match will be made at a subsequent reader/detection station. Post Oak Traffic Systems products employ a patent-pending inquiry process to circumvent the limitations of the default Bluetooth inquiry process. This method performs device requests asynchronously, which allows detected devices to be reported to the software immediately after they are recorded by the Bluetooth adapter. Once implemented, this process provided an approximate 50 percent increase in the number of non-duplicative reads and increased the resulting match rate for a link by 51 percent. Employment of this method enables more robust monitoring on facilities with less traffic (for example, lesser traveled arterials) than any other probe-based travel time monitoring system. Utilizing Bluetooth addresses provides highly accurate travel time samples because the technology directly measures travel time rather than estimating it from point based sensors such as loop detectors and radar. As of 2010, it is estimated that 20% of vehicles have some kind of Bluetooth-enabled device that can potentially be used to sample travel times. This number will increase as Bluetooth devices become more prevalent. Accurate traffic data can be collected on both high and lower volume roadways. Device readers are the size of a cigar box, low-power, and non-intrusive to the roadway infrastructure. They can easily be installed in a matter of minutes. The Bluetooth protocol is a standards-based, open system that is not controlled by a single company. We have designed our products around the open concept using technologies and protocols (such as Linux and TCP/IP) that are standards based, modular in nature, and easy to integrate. Because of the standards-based nature of the Bluetooth equipment and the wide availability of products, the cost for acquiring a Bluetooth-based traffic monitoring system are several orders of magnitude lower than competing traffic monitoring technologies. To benchmark performance, Post Oak’s Bluetooth-based AWAM system was installed alongside a probe-based toll tag (AVI) system. The charts below show a full day's comparison of speed samples collected using both AVI toll tags and Bluetooth MAC addresses. In this comparison, AWAM is collecting more data samples at a fraction of the cost of the competing technology.